Emmy demands candy at eight o’clock in the morning. I say one little word. No. Serious pleading for candy begins. I get a book. I ask Emmy if she would like to read it with me. If enough time has elapsed, and Emmy feels as though she has shown me her displeasure long enough, she will agree to read the book with me! 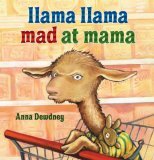 Llama Llama Mad at Mama is one of Emmy’s favorites, and when I read it to her after her last tantrum, we talked about how Emmy was mad at Mama. Llama Llama is also mad at Mama, after Mama drags Llama Llama away from Saturday morning playtime and takes Llama Llama to the dreaded Shop-o-Rama. Llama Llama has THE meltdown of all meltdowns at the store. Llama Llama’s Mama proves to be way more patient than this mama would have been with that kind of meltdown! Together Llama Llama and his mama work through the “llama drama”. It’s been a while since we read this book, since we don’t own a copy. Llama Llama is delaying bedtime, just as all children do! I remember loving Llama Llama Mama’s response to all the bedtime delays. I’m thinking I need to include this book in Emmy’s Easter basket! To read some more reviews of wonderful children’s books, click on Janna’s button below! 9 Responses to Llama Drama! I've seen the Llama Llama books and really want to get them at the library next time. I thought they looked good, now I know. Thanks! We LOVE the Llama Llama books, too! We have all 3 mentioned above – but I think "Llama Llama Mad at Mama" is Nate's favorite. "Llama Llama Misses Mama" is PERFECT for the start of school! I read it to my preschoolers at the beginning of the year! 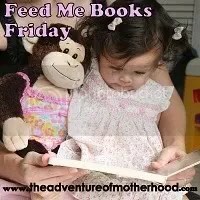 MY boys LOVE these books. 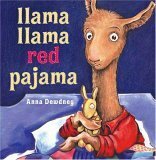 One that we read close to the beginning of the school year, "Llama Llama Misses Mama"
WE've read the bedtime one and she was just talking about it the other day saying llama llama red pajama! Thanks for the tip on the llama drama! I love how books can be such practical illustrations of feelings kids are facing! I have not seen the Llama Llama books. But I've definitely accused the kids of being drama llamas themselves. I'll have to see if I can find these at the library. And I feel you on the candy. My youngest would eat sugar straight out of the canister if I let him. Sound like two good books. I will put them on my list of books to buy. Hoppy Easter! Oh I don't miss the tantrum stage!! Q: What should we do with all that Easter candy we don't want the kids to eat? A: Send it on the plane with Aunt Meredith! We have Llama Llama Red Pajama. I've never heard of the mad at Mama one! I'm totally gonna check that one out! Thanks for sharing!